Tom "Tsutomu" Matano is an advertising agent, automotive designer, and automotive journalist. Matano was born in Nagasaki, Japan, and continued to live in Japan until after his studies in university. He began an Analysis Engineering Major at Seikei University in Tokyo, Japan, in April 1965 and graduated in March 1969. Following his graduation, Matano moved to the United States in September 1970 via his uncle's container ship, landing himself in Seattle, then to Los Angeles, and finally New York City. Once in America, he continued his education with a semester of language school, ditching plans to transfer to Environmental Design, and graduated in 1974 for a job in Detroit with General Motors. Consequently, due to Matano's work visa and the rising oil crisis, GM moved him to Australia to work for Holden Design along side Phillip Zmood, mostly working on the GM Holden Torana, departing in 1977 for Germany and BMW in Munich, Germany. In 1983, Matano joined Mazda as Chief Designer for Mazda North American Operations, then moved up to become the Vice President of Design and eventually the Executive Vice President of Western Operations for Mazda R&D North America, Inc., as well as the Executive Designer and Director of Mazda North American Operations. In his career with Mazda, his notable designs stand out in many vehicles, such as the Mazda RX-7, Mazda MX-5, the Miata "M-Coupe" concept car, and numerous other projects with his large group of design teams he created. Before 1983 Numerous design positions within BMW, Volvo, and GM. 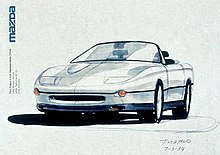 Tom's work with Mazda to sketch the first generation Mazda MX-5 Miata. Part of Matano's history with Mazda in the years 1983-2002 was spent on the design of the Mazda MX-5 Miata with fellow designer C. Mark Jordan. ^ "Mazda Miata MX-5 designer Tom Matano a.k.a Mr.Miata and me - WHEELS.ca". WHEELS.ca. Retrieved 2017-03-14. ^ "Tom Matano, IDSA". Industrial Designers Society of America - IDSA. 2012-04-09. Retrieved 2017-03-14. ^ Dominguez, Sally. "Tom Matano". Curve. Retrieved 14 March 2017. ^ "Man behind Miata decides there's a Next act in design". Automotive News. Retrieved 2017-03-14. This page was last edited on 13 January 2019, at 10:51 (UTC).